Remote Proactive Monitoring - Aegis Business Technologies, Inc.
Aegis Network Remote Proactive Monitoring (RPM) is the next step in the evolution of network support and maintenance. RPM is a software program that scans your network infrastructure, collecting data on hardware and software errors, detailed equipment information, and critical events. RPM not only reports and monitors, it also allows for remote management of your environment through automated tasks, remote desktop support, and Windows Update management to proactively maintain your environment, saving you time and money. With over 12 years of experience with business technology and innovation, Aegis is equipped and ready to streamline your technology and take it to the next step in reliability and efficiency. RPM allows Aegis to monitor and manage your network and technology in real time from our secure servers at the Aegis Headquarters. The central dashboard displays an overview of all of our customers with an alert viewer; allowing Aegis staff to quickly see issues as they arise. When utilizing RPM in your environment and in conjunction with an Aegis IT Service Plan, our staff will have the capability to respond and solve your technology issues proactively. Not only does RPM provide for greater crisis management, it also allows us to plan and optimize your environment through reporting and statistics. RPM collects detailed data on server and network utilization. This data can be used to pinpoint bottle necks in your network and provide data for making more informed decisions on network upgrades and expansions. Aegis provides three levels of licensing for RPM software. These levels allow us to customize your RPM experience based on your technology needs. The levels are primarily segmented according to the size of your environment. Designed for small businesses with up to 10 workstations and 1 server, or a combined total of 15 network devices, this basic level provides monitoring and alerting for your environment. In combination with Aegis’ award winning technical support; the 1,000 RPM level can provide you with a peace of mind that, until RPM, was only available to enterprise businesses with full time IT staff. The 2,000 RPM level is customized for businesses with approximately 10-60 workstations and 1-15 servers, or a combined total of 75 network devices, and provides a robust set of features for small to medium sized organizations requiring greater security and asset management. This level also includes two, semi-annual IT review meetings to assist in IT planning and review of RPM reporting with Aegis IT and Management staff. Enterprise level businesses requiring additional support and network management will find the 3,000 RPM level provides even greater benefit in managing their IT goals. This level can support up to 254 network devices containing up to 30 servers. At 3,000 RPM, Aegis can automate maintenance tasks and Microsoft updates, saving time and enhancing performance across a large network. Automating maintenance functions allow IT staff and Aegis to focus on enhancing core IT functionality. Also, with this level, your staff will have access to the central management system, allowing more control over your enterprise level IT environment. With continuous monitoring, Aegis can see alerts and problems generated by your servers, workstations, printers, routers, and other network devices. Aegis will identify and suggest key network elements to be monitored such as file servers, backups, anti-virus, email services, database applications, firewalls, and internet connectivity. Aegis will proactively monitor your network and will have the ability to remotely address potential points of failure before they become critical. RPM provides secure log in and access to the remote desktop or laptop computer for faster and more efficient issue resolutions. Aegis will set up and configure alerting thresholds, criteria to be met before an alert is issued, for each device in the central dashboard that provides Aegis employees and your staff (optional; included with 3,000 RPM) real time information of all devices that are being monitored. When a site visit is required, alerts and monitoring data will assist in providing a more rapid response time. RPM sends the event logs and network information data to our secure server using industry standard security protocols. RPM does not transmit company documents or network password information. RPM is strictly designed for reporting and monitoring of computer network statistics and information. RPM provides for automatic discovery and alerts of new devices on your network. Live monitoring by Aegis is provided during regular business hours. RPM software collects network information 24×7 and can be configured to provide automated email alerts, sent to a member of your staff. 24×7 live monitoring is an additional option and is not included in our standard plans. RPM allows Aegis to provide your organization with detailed reports and information on your environment. 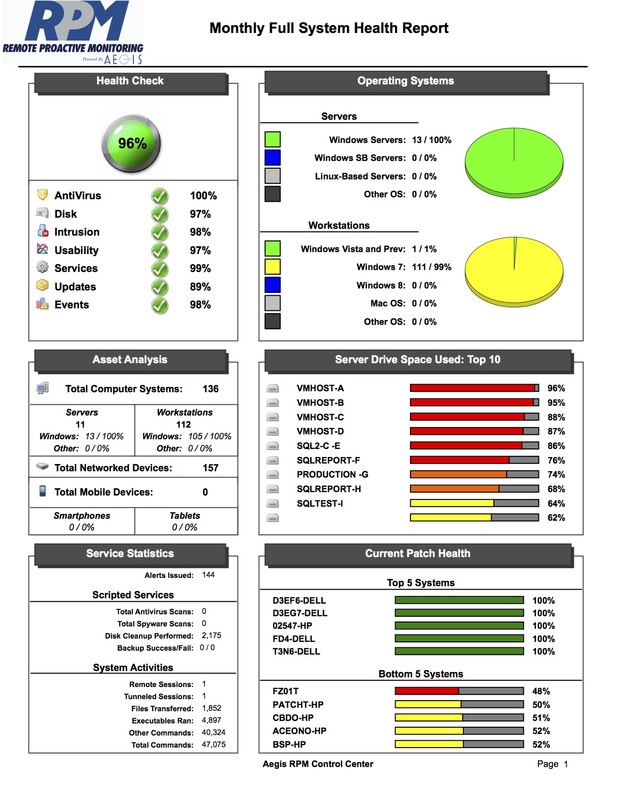 These reports give you real numbers and statistics to enable informed decision making in regards to your technology. Review equipment availability statistics on your entire enviroment and specific equipment. Reporting allows us to track performance history on servers, workstations, and even websites to review optimization. Track alerts for your environment and the response time for those alerts. Aegis can automatically configure reports to be emailed to you as needed. Some reporting features, such as patch management and detail inventory, are only available to the 2,000 and 3,000 RPM levels. RPM allows Aegis to track your IT assets in real time. We can see changes made to your current hardware as soon as they occur. RPM tracks your computer models and specifications, software installed on each computer, and allows for workstation replacement tracking. Pinpoints older computers for replacement and computers requiring upgrades. Provides detailed equipment information useful for disaster recovery and insurance purposes. RPM can assist in providing security reporting and diagnostics through integration with Microsoft® Baseline Security Analyzer software. The Microsoft software is currently provided to the public free of charge by Microsoft and is subject to their licensing terms. Microsoft® Baseline Security Analyzer (MBSA) helps small- and medium-sized businesses determine their security state in accordance with Microsoft security recommendations and offers specific remediation guidance. MBSA can improve your security management process by detecting common security gaps and missing security updates on your computer systems. Security Assurance includes the scanning of your environment on an automated basis as technically necessary. MBSA reporting integrates with the RPM reporting services therefore alerting Aegis and your staff of possible security vulnerabilities needing attention. Help identify IT solutions that will address existing and future IT requirements allowing you to ultimately make financial decisions. Workstation performance enhancement is conducted through the implementation of automated maintenance tasks which are configured and executed by the RPM system. These tasks include disk cleanup, disk defragmenter, and other tasks dependent on the needs of your individual environment. These tasks run and report data back to RPM for statistical use. RPM automates standard workstation tasks and saves your staff valuable time in maintaining their computer for the greatest efficiency. Microsoft® Update Management allows RPM to manage and deploy Microsoft® updates and patches on your workstations and servers. The central management system allows Aegis to monitor for proper download and installation of recommended updates. Updates are approved by Aegis staff in the central management system before being deploying into your environment. This allows Aegis to test updates if necessary before they are deployed, and provides greater consistency and control in updating the environment. Ensuring updates are installed is a vital first step in securing any network. Update management helps to automate and streamline the update process. Aegis can setup key employees with access to the RPM system. Access to the system will allow employees to see their network environment and gain access to the central dashboard, reporting, alerts, and asset management features, depending on licensing level. Installation cost is a fixed cost to install the RPM software in your environment on the recommended hardware as listed. The fixed installation cost will not apply to equipment or installations that deviate from the standard requirements. Installation costs are non-refundable. Aegis reserves the right to evaluate your network environment and quote additional installation time based on your specific environment. Remediation services are not included in the cost of this licensing contract. In the event of an alert or issue discovered by Aegis staff, we will seek approval for remediation of the issue from your designated representative for remediation requiring more than 30-minutes of technical service labor. We will attempt to automatically remediate minor issues in which we estimate the remediation will not require more than 30-minutes. If minor issue remediation surpasses the 30-minute mark, we will seek additional approval from your representative. Technical support provided in remediation of alerts or issues arising from RPM will be billed according to your current technical support relationship with Aegis: standard Aegis per hour rates (no Block or Contract), block of hours or IT Service Contract. Microsoft Windows Server Update Services (WSUS) 3.x. Aegis will examine your equipment for compatibility with specifications listed below and reserves the right to provide an additional estimate for installation costs, if needed. Requirements are subject to slight variation, dependent on your environment.